It’s stark and it’s remote, very hot this time of the year, (not far from Marble Bar – Aust hottest town) has abundant permanent water holes, sheer red cliffs, sits in the middle of one of the highest Iron Ore regions on earth and has some of the most spectacular accessible gorges in Australia – this is the amazing (& very photogenic) Karijini National Park in WA. Karijini was the 2nd key target of our trip and a park we had heard so much about and planned to spend some quality time to properly explore its many wonderful gorges, landscapes, wildlife and waterfalls, most of which are moderate to easily accessible to the general walker/hiker. 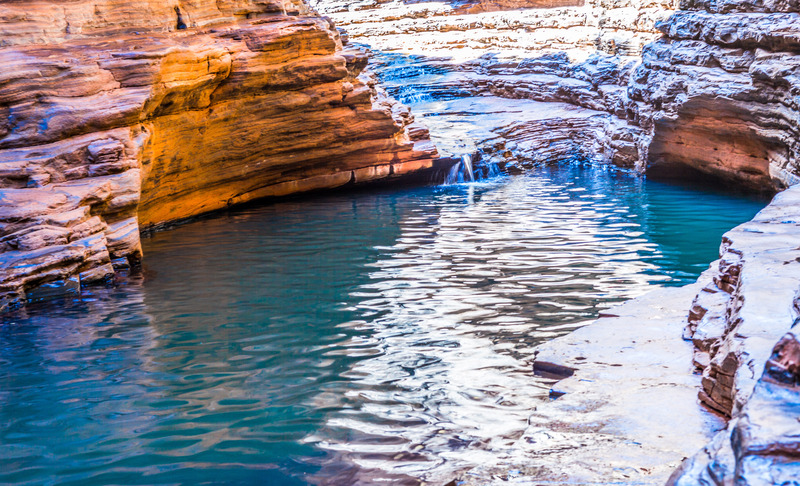 Situated in the Pilbara Region, Karijini National Park is located approximately 1,400km north of Perth and around 90km’s north-east of the “Rio Tinto” town of Tom Price. Karijini (formerly Hamersley Ranges) National Park is the 2nd largest national park in WA and is a camping only park. We arrived in Karijini from Port Hedland on another very hot day (40 deg) and set up camp in the Dales Gorge Campground. There is no drinking water or power, but we had a good position with an eco-drop pit toilet across the road from our site which was handy. This place is harsh with lots of flora and fauna, very sharp and gnarly spinifex everywhere, many species of birds (some unique to Karijini), plenty of reptiles …however we came to spend time in the star of the Karijini show – their spectacular gorges. 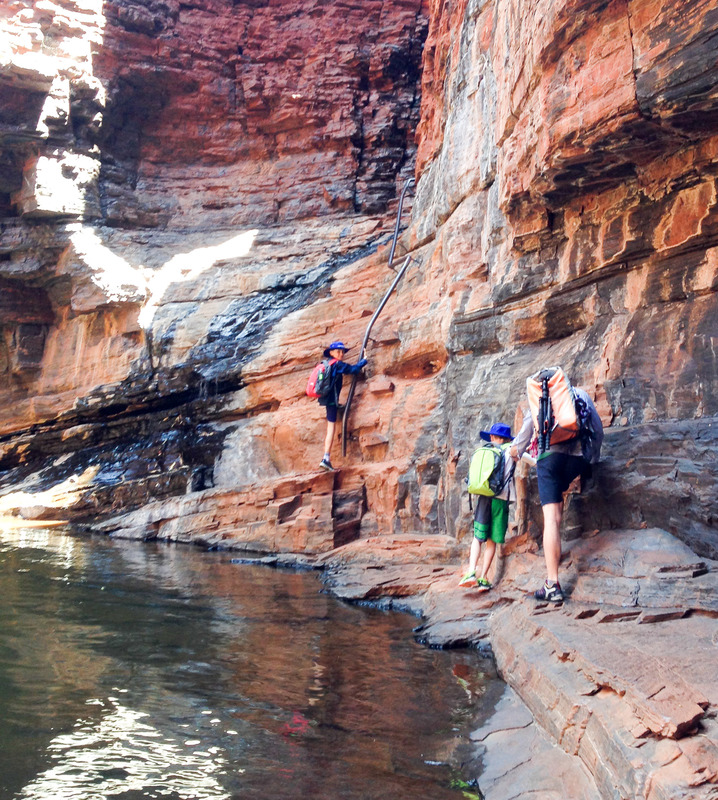 The boys heading down into Dales Gorge with Fortescue Falls in the background. If you look close enough, just left of the top of the falls you will see a yogi-man doing his thing. The first gorge we hiked into was at Dales Gorge not far from our camp. We headed off and made our way down to Fortescue Falls and then up-stream 300 mtrs to the beautiful Fern Pool. It was late afternoon and we quickly snuck in a swim just before sunset which was very refreshing considering the temp. The rangers earlier that afternoon told us about a colony of flying foxes at fern pool and a family of (now) 17 Corella’s as one was taken in the morning by an Olive Python and was seen in a tree above fern pool, presumably digesting the bird. The boys looked for it but we could not find any signs of the snake or remaining Corellas. After a hot night, the next day we headed across the park some 48Kms on the rich red gravel of this region to Weano and Hancock gorges – both accessible from the same car park. We arrived at 8:45am and was already 34deg but as we made our way down into Weano gorge to access Handrail Pool, the temp dropped 6 or 7 degrees by this stage – a great temperature. Handrail pool was first and is a grade 4 gorge (grade 6 is highest) and has a somewhat difficult last climb-in section on a handrail which was exciting for the boys and they both enjoyed the challenge. To access the further reaches of the gorge you need to do lot’s of swimming through various linked pools, often quite deep with some appearing bottomless. We took our lunch, various things and camera equipment, placed them all in a “dry-pack” so we could float it on the surface of the water and push it along in front as we swam behind. To the left you can see the boys on the handrail and makeshift steps at Handrail pool. It was a lovely spot and very popular with all tourists on this day. The furthermost section of handrail pool was this rather delightful torqiouse pool which the boys had a great time in for over an hour before swimming back out. Hancock Gorge was next in the afternoon and after a 30 minute descent we reached the first of 3 sections you must swim through to gain the final pools. These were a true adventure for the boys as these small and sometimes deep sections of water made all the more enjoyable wondering what lies beneath. Naturally, Celia and I had a lot of fun suggesting all manner of creatures lurking below that might like a young little toe or two if they were not quick enough. The image above and to the right was the final reward of our efforts and boys had a great time jumping into the deep pool for more than an hour whilst Celia and I took some lovely respite from the heat. On day 3 in the park we headed further across the other side of Karijini NP to the Hamersley gorge. 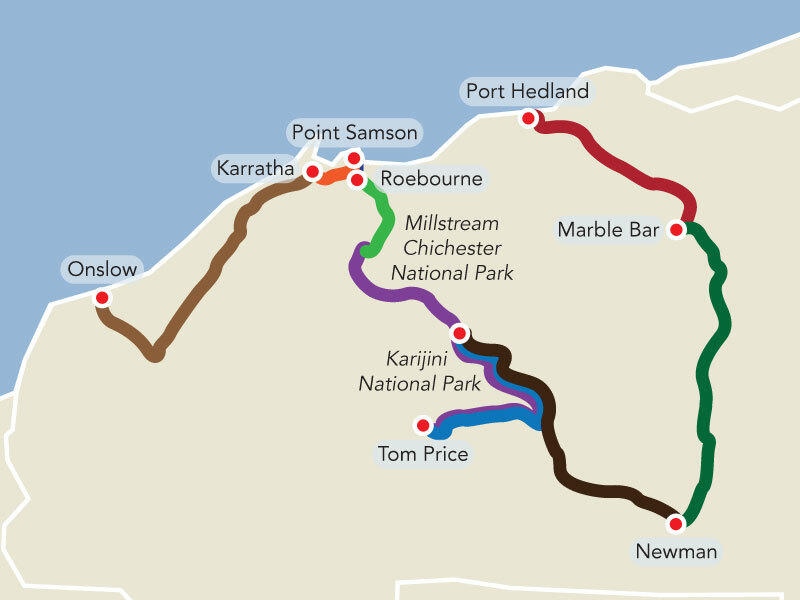 A trip of approximately 110kms each way was across some great conditioned dirt roads, some of which are maintained by the mining companies. 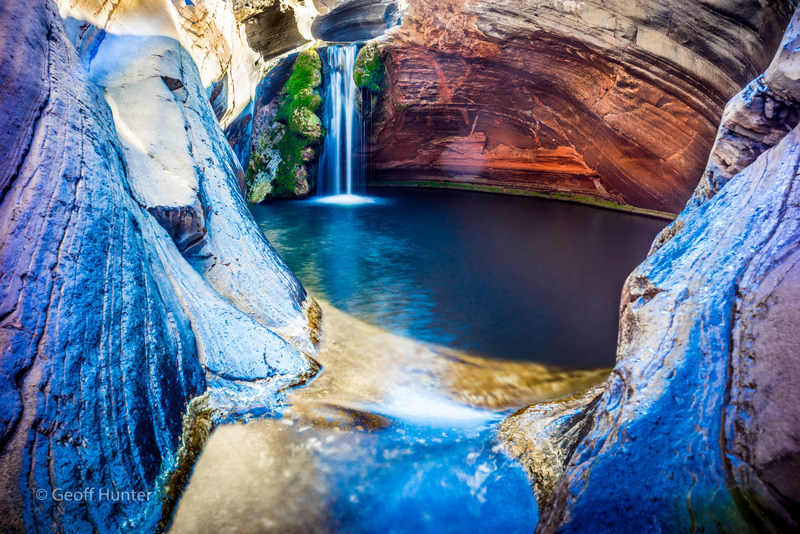 Hamersley Gorge is best known for its “Spa Pool” in the upper reaches of this spectacular gorge – the feature photo I took of this blog. This descent into this gorge is not as steep or long as the others we had hiked into but is one of the more challenging due to the type of rock formations and how slick (smooth) this rock is in places with sections of grade 4 and 5 to negotiate. 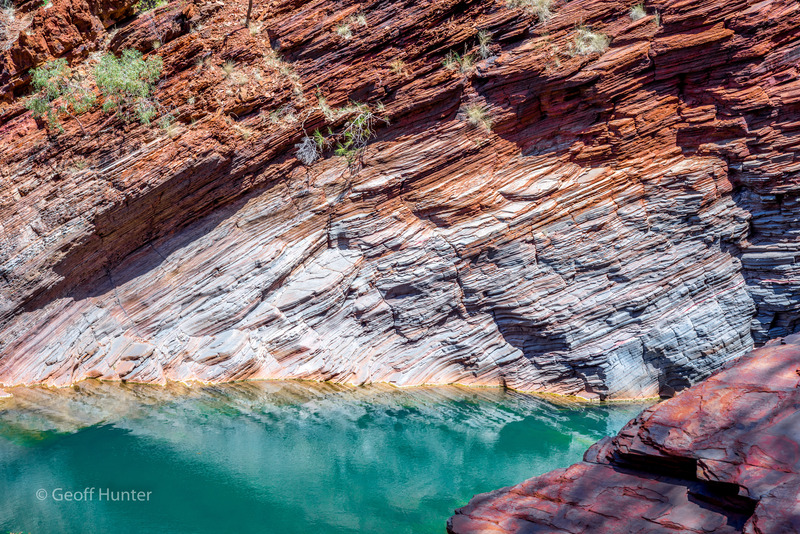 There are many pools to swim in with one of the larger pools in the lower section of Hamersley of 300 meters in length protected by large towering red walls on both sides. However, it was Spa pool that we came to shoot and of course, have a swim in it as well. 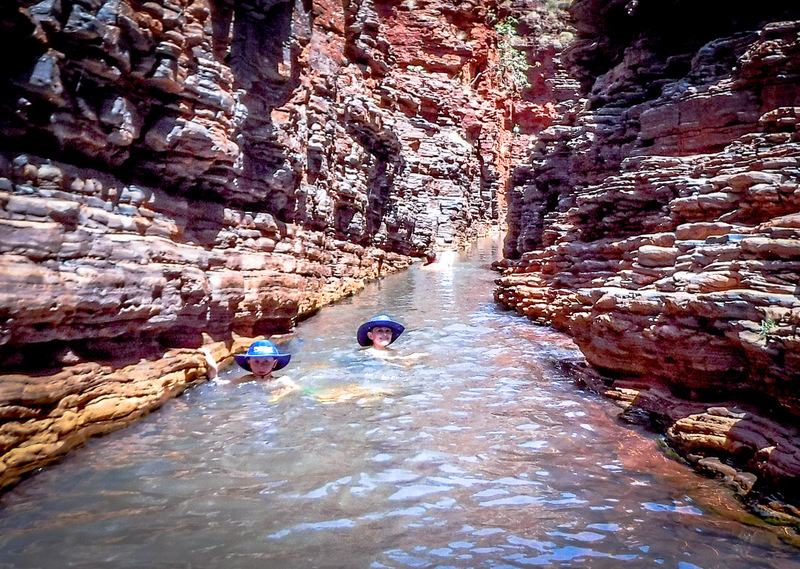 A Hamersley Gorge swimming hole. We had to force ourselves to get into them … not really. As to my highly anticipated photo shoot of Spa Pool, I have been looking at shots by many pro-photographers of this pool for many years, but when we arrived, the sunlight was all wrong. It was the wrong time of the day and the sunlight was much too harsh and washing out the beautiful natural colours that this pool has. We waited for a few hours for the sun to move further west to see the change but to no avail – the pool suffered from a lot of reflective light too. So we swam some more (it wasn’t like we had nothing to do :)) – particularly in this pool and waited for the sun to set lower in the sky. By this time it was late afternoon and the light was still not playing ball and we had a 1.5 hr drive back to camp so we decided to call it a day and to come back to do the round trip early the next day. That night we were cooking a BBQ dinner just after dark with head torches when we looked down at first hearing, then seeing a small western brown snake crawl out of the spinifex bush right behind our barbie. He did not care about us in the slightest, Lochie was a little concerned and was not too sure, but he slithered off as quickly as he came and we never saw him again. It was the third snake in 2.5 months we had seen. On day four we all got up at 5:30am and left camp at 6:30 and arrived at the Hamersley Gorge car park just before 8. We were the only ones there and headed straight to Spa pool only to my incredible surprise and disappointment, to see way to much early morning sunlight hitting Spa pool – Doh! The sudden realisation that this shot i wanted was a sunrise only shot and long exposure to get the right light evenly distributed across the pool, rock walls and to extract all the colours, was not going to be taken on this visit. Ah well, we were not going to come back all the way across the park for a third time as we were all over the intense heat, but especially, our diesel reserves were now getting low (were onto our 2nd jerry can) so I had to make do with the light I was given. 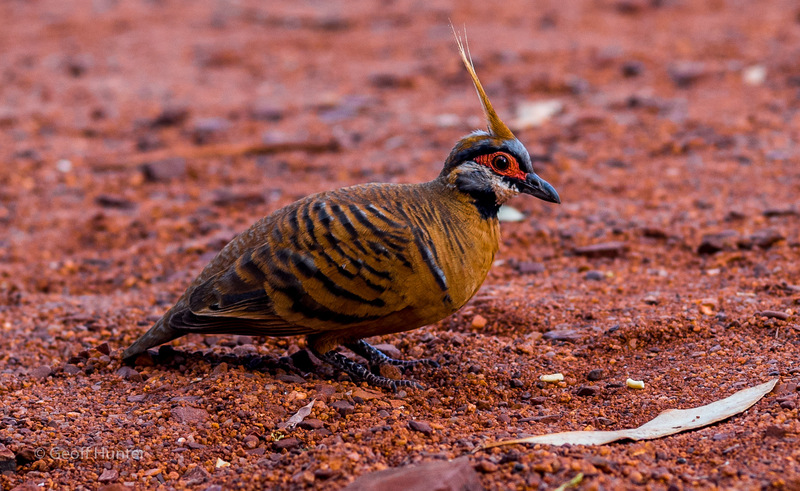 A rather friendly Spinifex Pigeon who visited us most afternoons at our Dales Campground site which are unique to Karijini National Park. Celia loved feeding him dry noodles. After a couple of hours for a 2nd time at the Spa pool, and a final swim, we decided to head back to the car park and take off for the Rio Tinto Gorge and then zoom across to Whittenoom to see this abandoned, once blue asbestos mining town before reaching the Auski roadhouse a further 55kms on to get some much-needed diesel. Around the Whittenoom area, there are many Asbestos warning signs like this one. We even saw Asbestos warning signs before entering some of the gorges in Karijini NP. It was around midday and on the way not far from Hamersley gorge we saw a 4 backpackers in the bottom of Rio Tinto Gorge road pulled off the road looking at the back of their Mitsubishi Pajero. We slowed but they appeared to be okay, didn’t signal us so we continued on the wide gravel mining road and 20kms down, came across an Iron Ore train coming towards us so we pulled over to look at this 2.5km long train. We walked up to the tracks to get a closer look with our camera’s in hand, including Aidan, a toot, big smile and thumbs up from the train driver, the train came and went and we jumped back in the D4 and headed towards Whittenoom. Another 20kms down the road, we saw once again the backpackers we saw earlier only this time they flagged us down for some help. We pulled over behind the Pajero and I could see they we trying to change a flat tyre – apparently the 2nd flat that day, and it was now 40deg. There were 3 girls: two chinese, 1 swiss, and the guy was a Brit, and they were not well equipped to get themselves out of much car trouble. Their spare was already trashed (you can see it on the back of their car with a huge hole in the sidewall) and they had no way to mend the punctured tyre sitting on the rear of the car. The young guy was pretty much clueless so I repaired his tyre using a tyre plug kit (essentially bit of kit in the outback) and then used our air compressor (his was not working) to re-inflate the tyre. The plug held and tyre pressure was now holding so they packed up their car and off they headed to Auski and we packed up our stuff used to help them and headed once again to Whittenoom. Whittenoom is a de-gazetted town these days, essentially a genuine ghost town. 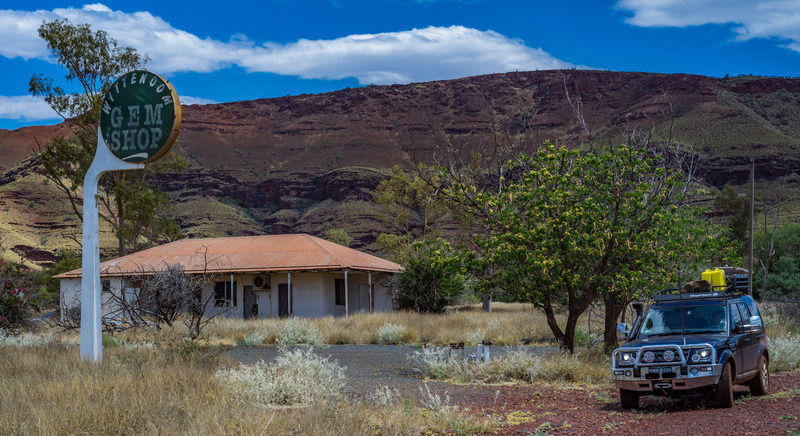 Back in the 1940/50’s, Whittenoom was Australia’s largest deposit of blue asbestos and was until the early 60’s the largest town in the Pilbara by population. The town was named by the late Lang Hancock and was ordered to be closed down and abandoned by the mid-60’s and apparently has 3 people still living there today. We pulled onto a non-descript disused road and drove around the old town that display keep out signs on buildings everywhere and stopped and took one quick image of the old gem store. We soon left the erie town and headed to Auski for diesel and a late lunch and when we pulled up at the roadhouse, we see our backpacker friends refueling. The tyre plug had held and the Brit said with a big grin, we’ll keep on driving until we can get a new tyre or it fails. (Risky and perhaps silly, but hey, thats what (some) people do). We never saw them again so we can only assume they safely made it to where ever they were heading? We arrived back at camp about 4pm. We quickly headed down to Fortescue Falls again for a quick dip to cool down from the long day whilst watching all the small family of Corellas’ silliness and squawking before sunset. 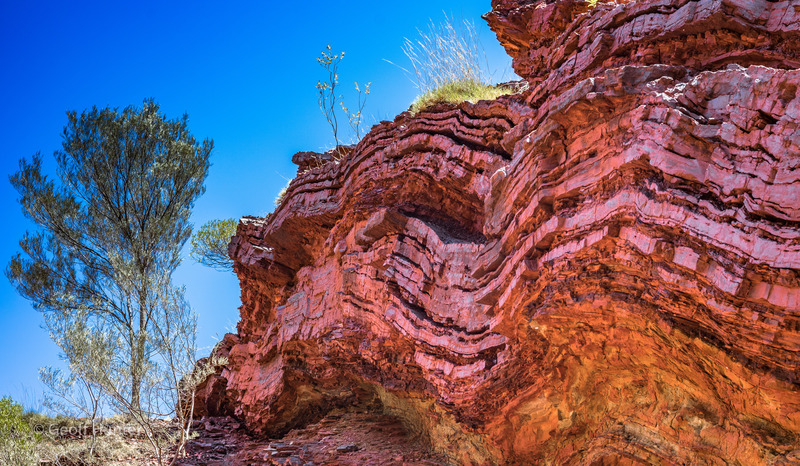 You see these types of rock formations all over Karijini park and yes, they are often this rich in colour which is amazing. The iron content in this area can be very high that some rock can be slightly magnetic naturally. We spent 5 days in all in Karijini and wished we could have stayed at least another 2 or 3 days to fully take the park in and do all the remaining gorges we missed. But in end, it was just too hot for us and decided to head to Tom Price the next day for supplies, to do a Rio Tinto Iron Ore mine tour, and stay the night at a van park with a swimming pool and power to run our A/C to cool down again and catch up on some sleep. At every turn, there is a magical vista, or an incredible rock formation, a tranquil waterfall, a luring pool to plunge in. Here we are late one afternoon heading back to camp from the Hamersley Gorge that is a typical Karijini NP landscape. The park is best visited from May to Sept, the coolest months of the year and straight after the wet season. And even though we spent 5 days in late October, the park was not looking at its best, flora was browning, heat was becoming intense and nature was patiently waiting for the wet season to restart all over again. Mid-May is when visitors start rolling in and if we ever get the chance to come back here again, and I certainly hope we do, then this is the month when we’ll most definitely return. 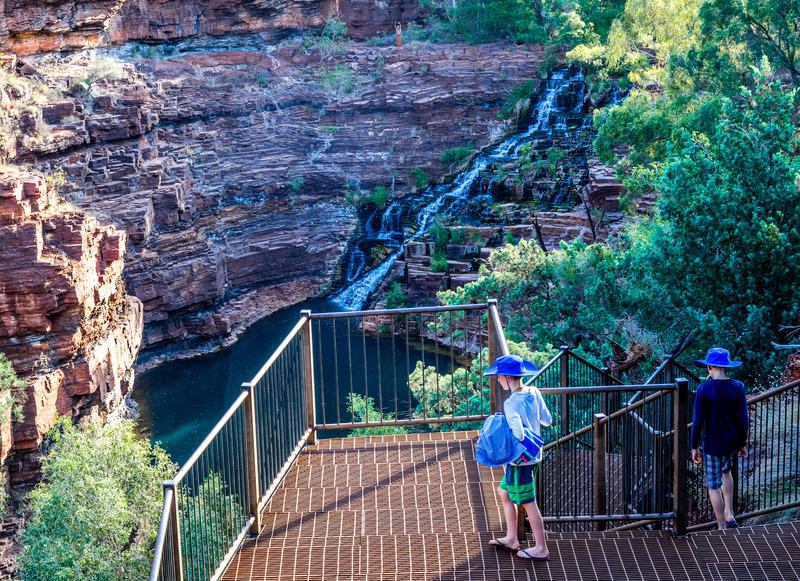 Karijini is one of those truly special out-of-the-way places that has not been significantly altered by “over tourism” and perhaps this is due to its remoteness, the indigenous management of the park, or because of the many better gorges are best accessible by 4WD? Whatever the reason(s), Karijini is still largely unspoilt and we genuinley felt privileged to have visited and experience her beauty that is unique in this country, perhaps even the world …and we loved it.